About urban farming, resilience and urbanism. The past decades gave birth to an urban way of life which is very demanding. Those who do not have the means to adapt to an ever evolving socio-economic environment are more vulnerable. And it can be fairly assumed that the number of people who will face difficulties will grow: according to the United Nations (1), more than half of the world’s population lives in cities and the trend should not reverse. If assessing the role of urban farming as a mean to improve resilience is regularly discussed, its physical integration within the urban frame is also worth to consider. Food security, as such, remains questionable (R. Aerts & Al review (2) concludes that a 1 million inhabitant city could not produce more than 5 % of its needs in fresh products). Though, rooftop gardens, vertical greenhouses or indoor farms, are expected to offer more opportunities in terms of sustainable environment and social cohesion improvement. An interesting example is provided by a detailed study on the role played by NYC Latino community gardens showing their contribution in enhancing the community cohesion (3). And overall, the development of urban ecosystem services, defined as the direct and indirect ecosystem contributors to human well-being (4), are known for their ability to reduce “Urban Heat Island” effects. But what would then be the consequences on the urban landscape? Will urban farming be confined to greening building roofs or is a broader dimension linking rurality to urbanity conceivable? Beyond questions related to sustainability, local food supply or climate change regulations, an in-depth review on the dichotomy between “rural” and “urban” is worth to evaluate. Sociologists S. Tappert & Al. (5), could demonstrate how different cities in Switzerland, aiming at efficiency, implemented strategies to reorganize and rationalize the space. But in the same time urban gardens were closed down and displaced to locations having less significance for urban development planners. This rupture in the continuum between urbanity and rurality seems to be fully contradictory with a new way of living the city that does not correspond to such binary exclusion. Opposing the two concepts is seen by many sociologists as a way to reinforce a stereotype relying on an obsolete and oversimplified relationship between space and individuals. Nowadays, while rural areas are more and more “urbanized”, and cities “ruralized”, the interaction between both concepts enable to create new paradigms, encouraging new forms of urbanism and ultimately improving urban resilience. Should we accept the idea that dividing our living space between urbanity and rurality is arbitrary, and can be reconsidered depending on residents “way of life” more than on territories, the achievement of urban farming can go far beyond its status of “green amenities”. And obviously, this leads to the question of agriculture and architecture integration in the urban frame. 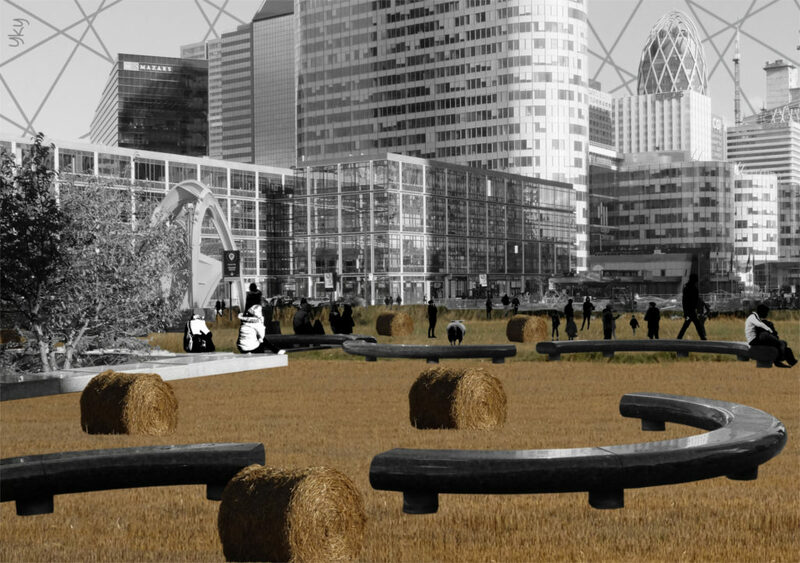 The development of urban farming is still in its infancy. But there are fair reasons to believe that it is on a positive trend and will pursue its development. With current socio-economic models challenged by a population with diverse cultural capitals, the risk of disruption is not negligible. When conditions for a cohesive social development are met, urban farming could find its roots. But its growth will depend on its importance and integration level in the city life. Obviously, financial operations speculating on land prices will not help as shown by greening strategies displacing minorities (6). Urban citizens should rise up against such plans. Reaching the right balance to improve our wellbeing and well-living is still a long way. As recalled by Ritchot & Al, and emphasized with the below work, cities growth is always linked to new social projects that need to be consistent with their urban space reorganization (7).